A big happy birthday to your human! Give her some headbutts for me. Happy Birthday to Mum Paula!!!!!!!! Happy Birthday to Mom Paula! You girls take good care of her like she always does you! Happy Birthday to Mom Paula from all of us!!! Happy Birthday Paula. Hope you have a really good day. Happy Birthday to Mom Paula! Wishing your wonderful mom, Paula, a very Happy Birthday!!! Happy Purrthday to your wonderful Mom ! And many more ! Hope your mom is having a purrfect day! Happy Purrthday to your mum. Happy Birthday, Mom Paula! Our mom wasn't on Facebook much yesterday, so she missed it! She's running over there right now! Belated happy birthday to Mom Paula! I have been away for a few days so missed it on the day. 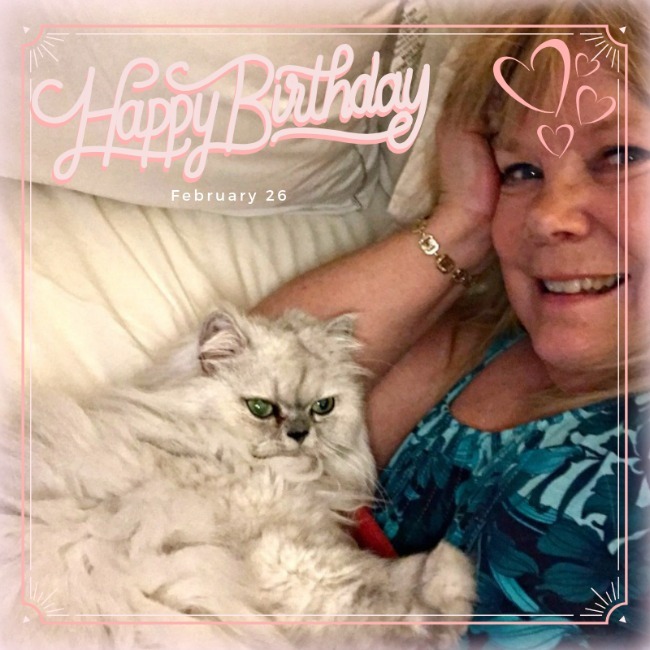 What a purr-fect birthday portrait! Belated Birthday wishes, Miss Paula! I hope your day was magical! I send you purrs from O-R-E Gon.